Bullying impacts all learning environments in profound ways. This book utilizes a larger cultural context and international perspective that broadens the traditional concept of bullying and proposes new approaches to a complex problem. 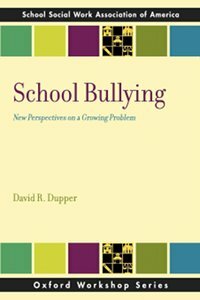 Author and social work professor, David R. Dupper, PhD, examines several “under the radar” forms of bullying (e.g., religious bullying, bullying by teachers and other adults in schools) as well as the challenges in assessing these largely unacknowledged forms of bullying in today’s U.S. schools.